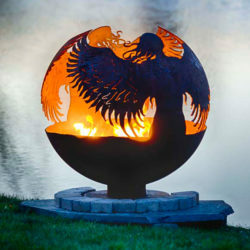 We design unique fire pits, custom spheres and accessories perfect for any outdoor space. Handcrafted in the USA with American-made steel, you can be assured your functional art lasts a lifetime. Our family-owned company is based in Bristolville, Ohio. Contact us through our contact form, phone, email or social media channels. Contact us through our contact , phone, email or social media channels.